Propane, also known as liquefied petroleum gas (LP-gas), is one of the nation’s most versatile sources of energy. This safe fuel serves approximately 60 million people in the United States in millions of homes, industry, farming and more. Propane is flammable when mixed with air (oxygen) and can be ignited by many sources, including open flames, smoking materials, electrical sparks, and static electricity. Propane has always been a “green” fuel, far ahead of today’s trend. Propane is used on more than 660,000 farms for irrigation pumps, grain dryers, standby generators and other farm equipment. It is an essential fuel for crop drying, flame cultivation, fruit ripening, space and water heating and food refrigeration. Propane is easy to transport and used in areas beyond natural gas mains. Because it is 270 times more compact as a liquid than as a gas, it is economical to store and transport as a liquid. The liquid propane is turned into a gas inside a tank or a cylinder. In its natural form, propane is colorless and odorless. To make propane easier to detect in the event of a leak or spill, manufacturers deliberately add a chemical compound to give it a distinctive smell. For further information, click the arrows on the tabs below to learn more about each topic. Propane has a strong, unpleasant smell like rotten eggs. Propane manufacturers add the smell deliberately to help alert customers to propane leaks, which can create a safety hazard. If the smell of propane is present in the air over a period of time, “odor fatigue” can occur. The nose “gets tired,” and a person no longer smells the propane odor. The propane smell may not be strong enough to wake up someone who is sleeping. 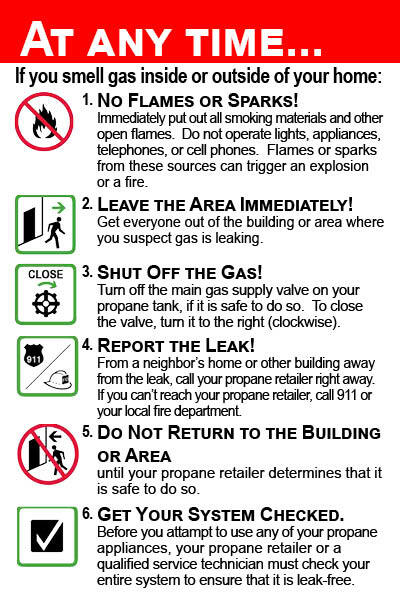 The propane smell may be in a location (basement or attic) where it is not detected by people in other areas of the building. A phenomenon called “odor loss” can occur-an unintended reduction in the concentration of the odor of propane.